Treasury floating rate bonds are an attractive option for short-term investments to maximize return and minimize risk. Interest earned on treasuries is generally exempt of state and local taxes. Benefits of Treasury floating rate bonds in high-tax states such as California are even greater. Bonds with floating coupon rates are more attractive when interest rates are rising. During a rising interest rate environment, floating rate bonds yield more income, unlike fixed-rate bonds whose prices tend to drop. This strategy can now be done with low-cost ETFs, making this strategy very accessible and liquid. In December 2015, the Federal Reserve started raising interest rates in response to economic growth, declining unemployment, and a steady rise in household spending. Fast-forward to today and monetary policy continues to tighten. Rates have gone up twice this year and are expected to increase another 4 or 5 times by the end of 2019. As a result, even high-quality low-cost bond funds have dropped in value this year. For example, the Vanguard Total Bond Market Index Fund (VBMFX), which has assets of nearly $200 billion and provides broad exposure to over 8,000 U.S. investment-grade bonds, is down over 1% year-to-date as of August 30th. As rates continue to rise, even such high-quality bonds are in need of careful evaluation for the risk of short-term losses. From this perspective, floating-rate bonds provide investors an attractive alternative as they yield more income than their fixed-rate counterparts as interest rates rise, and unlike fixed-rate bonds, their prices tend to hold relatively steady while those of fixed-rate bonds tend to drop in a rising interest rate environment. In essence, by allowing the interest rate to float, we remove interest rate risk. Floating rate treasury notes, in our view, are a great vehicle for short-term investing because they meet investor needs for security, liquidity, and stability (in the form of counter-cyclical behavior) while providing a slightly higher yield almost as an afterthought. This aligns well with the safety-first approach we feel is appropriate for short-term investments. In contrast, some investors will try to increase their yields by increasing their exposure to credit risk (the risk the issuer will go bankrupt). They do this by moving away from U.S. Treasuries and favoring short-term corporate bonds instead. This may be done by rolling over ultra-short-term corporate commercial paper as is often done in money market funds, or even holding a diversified portfolio of floating rate corporate notes or bonds. But in all cases, no matter how this is done, the approach brings credit risk back into the picture. Furthermore, this credit risk tends to manifest in pro-cyclical ways. In times of financial stress corporate bonds tend to fall (pro-cyclical) whereas treasuries tend to rise (counter-cyclical). In rare circumstances, such as the 2008 global financial crisis, this can be true for even highly rated corporate bonds. 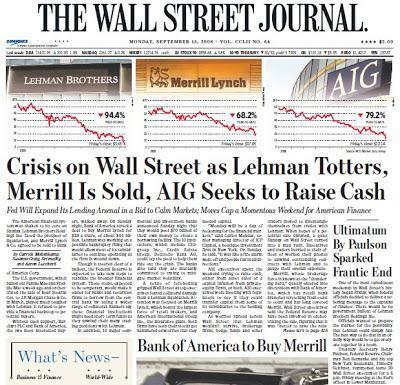 When Lehman Brothers collapsed in 2008, the bankruptcy filing was the largest in U.S. history, with debt of $619 billion. Some of that debt was held by money market funds following this corporate-debt-is-better strategy. As a result, money market funds, with the goal of never losing money and considered the safest of investments, were affected thereafter and started to lose value for the first time in decades. One company, Putnam Investments, closed a $12 billion money market fund to limit losses to its investors. In contrast, diversified treasuries were up more than 13% in 2008. We view this as an indication that the higher yields of short-term corporate bonds do not adequately compensate investors for assuming the additional risk of corporate defaults. Floating rate treasury notes were not offered by the U.S. Treasury until as recent as January 29, 2014. The last unique form of debt rolled out by the U.S. Treasury was the now famous Treasury Inflation-Protected bond (or “TIP” for short) back in 1997. These were a huge hit because they met a specific investor need, and have subsequently grown to a trillion-dollar market. Floating rate treasury notes were launched with a similar idea in mind. By allowing the interest rate to “float” (i.e. adapt in a changing rate environment), it means investors don’t have to speculate on which way interest rates are going to go (similar to how TIPS removed the need to speculate how much inflation would be in the future). And because it’s a treasury note (as opposed to a corporate bond/note) they need not worry about credit risk either. This allows investors to focus in on exposing themselves just to the risks they are comfortable with and that are appropriate given the needs for liquidity, security, and stability. After interest rate risks and credit risks are removed from the floating rate treasury notes, what remains is the “maturity risk premium.” While this is referred to as a risk premium, it is really the result of what economists call time preference. By holding floating rate treasury notes with maturities between 1 and 2 years, investors can move further out along the maturity spectrum-away from the 90- to 360-day bills popular in money market funds to pick up some of that additional maturity risk premium. Additionally, investors can hold these 1- to 2-year floating rate treasury notes through ETFs to avoid having to actually wait for each note to mature. There are two ETFs that focus almost exclusively on floating rate treasury notes: WisdomTree’s Floating Rate Treasury Fund (USFR) and BlackRock’s iShares Treasury Floating Rate Bond ETF (TFLO). While these funds are very similar, we prefer the WisdomTree fund because it tends to hold less cash, whereas the iShares fund will often still hold cash or more traditional money-market-like instruments. Also, the WisdomTree fund is the bigger of the two, which-all else equal-will tend to mean greater liquidity and oversight/scrutiny. Both enjoy the same low expense ratio of just 0.15%. As with all treasuries, there are also tax benefits that come with holding floating rate treasury notes. The chart below shows the yield of WisdomTree’s Floating Rate Treasury Fund as of August 31, 2018. Since funds that hold U.S. Treasuries are exempt from state taxes, the yield increases from 1.89% to 2.18% when it is adjusted for the highest marginal tax rate in California (13.3%). [We use the highest marginal tax rate in California for illustration purposes only. The resulting increase in effective yield will vary state to state and based on the assumed tax bracket where applicable.] As this example shows, for investors in high-tax states, this tax benefit can be quite attractive. The decision to share these insights on Seeking Alpha followed naturally from our own due diligence review of short-term investment alternatives. For the reasons mentioned earlier (size and cash allocations) WisdomTree’s Floating Rate Treasury Fund is our investment vehicle of choice for this floating rate treasury note strategy. But beyond strategy and vehicle selection, there are opportunities for wealth managers to take this strategy further through the details of implementation. For instance, at RVW Wealth, we work closely with the capital market desks at our custodians to purchase the funds at institutional prices, leading to additional value and return for our clients. There is also a small amount of execution risk associated with this strategy, where the value of the ETF position can deviate from the net asset value of the underlying floating rate treasury notes. We manage this risk by having our equity trading desk work closely with market makers to ensure ongoing efficiency and would advise other firms to do the same. Floating rate treasury notes allow investors to mitigate interest rate risk (which is important in the current rising rate environment), avoid credit risk (e.g. Lehman Brothers and the financial crisis), and obtain a slightly higher yield from moving out along the maturity risk premium spectrum. Holding these floating rate treasury notes inside an ETF “wrapper” allows investors to still get in and out (liquidity) while enjoying the higher yield. Hence, we get liquidity, safety, and stability – the three attributes our investors seek most from their short-term investments – with a higher yield (and tax benefit) gained almost as an afterthought. This kind of approach, in our view, optimized these tradeoffs in the order that matters most. We hope, after reading this, you will feel the same.